As you may recall, the Sitefinity 3.0 release candidates are now available for public download. Since I know many of you are still new to the Sitefinity scene and many more of you are still wondering what Sitefinity is all about, I've decided to create a few screenshot galleries that walk you through the entire CMS application. These galleries will help you understand what Sitefinity is, how you use it, and how it may be the missing CMS tool in your life. The first gallery has 42 pics (all with descriptions, so I'll keep this post short) and it shows you everything from installation to a basic overview of creating a new Sitefinity project (or site). A couple galleries will follow this one with pics that show more advanced stages of creating a new site and pics of the demo sites Telerik ships with Sitefinity 3.0. 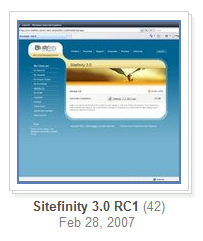 For now, grab a drink and enjoy Sitefinity 3.0 RC in pictures.